In this post, I will demonstrate how to download fantasy football projections from ESPN.com using R. Having projections allows us to do many different analyses to determine our best possible fantasy team. The projections on ESPN.com are currently from last year—they haven’t been updated yet for the upcoming season. ESPN will update them closer to the start of the season. In the meantime, last year’s projections can be helpful for determining their accuracy. An important note of caution: the ESPN projections do not include fumbles. If you know where ESPN includes projection data for fumbles, please let me know. To scrape the ESPN projections from the ESPN.com website, we will use the readHTMLTable function from the XML package in R.
See the full R script to see how the data were processed to be more usable. Five out of the top 6 projected players from last year were quarterbacks. As I will discuss in a future post, however, the number of points a player scores is not as important as how many points he scores relative to a typical replacement starter at his position. 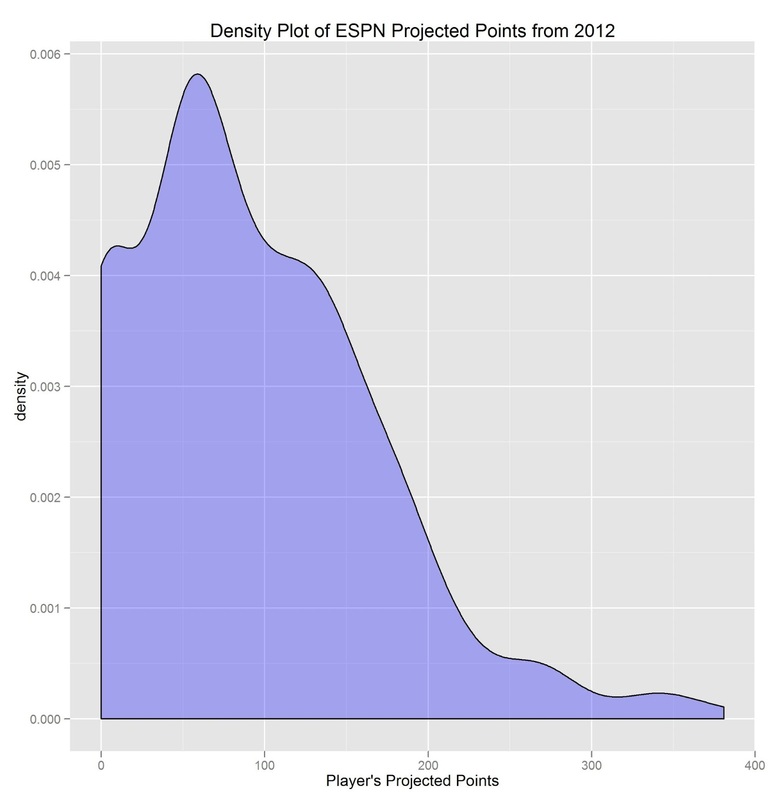 Below is a density plot of ESPN’s projected points. On the x- axis is the number of projected points for a given player. On the y-axis is the frequency of players with that number of projected points. The density plot shows a distribution similar to a zero-inflated Poisson or negative binomial distribution, where there are many players with 0 projected points, a peak around 50 points, and then a sharp decrease in the frequency until it tapers off above 250 points. In my next post, I will show how to download CBS projections so that we can see which site provides more accurate projections. If anyone has access to projections from other sources (e.g., Yahoo), please let me know.